Over the past two centuries Western culture has largely valorized a particular kind of “good” music—highly serious, wondrously deep, stylistically authentic, heroically created, and strikingly original—and, at the same time, has marginalized music that does not live up to those ideals. 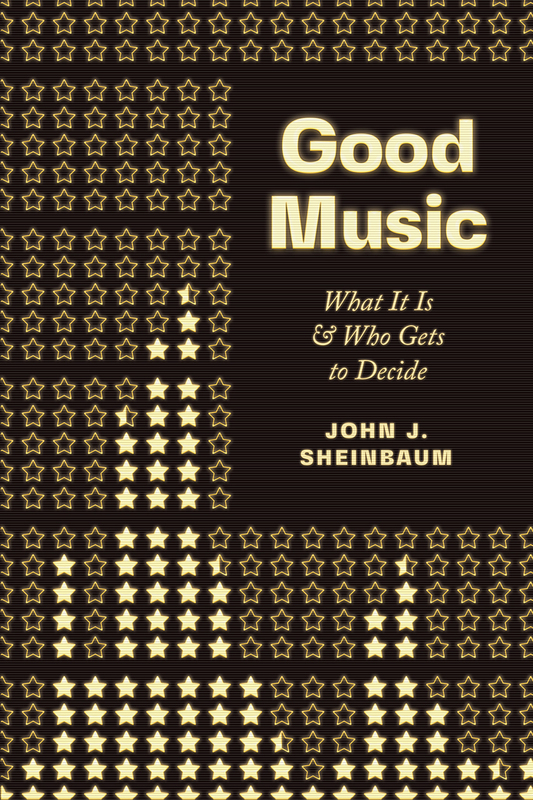 In Good Music, John J. Sheinbaum explores these traditional models for valuing music. By engaging examples such as Handel oratorios, Beethoven and Mahler symphonies, jazz improvisations, Bruce Springsteen, and prog rock, he argues that metaphors of perfection do justice to neither the perceived strengths nor the assumed weaknesses of the music in question. Instead, he proposes an alternative model of appreciation where abstract notions of virtue need not dictate our understanding. Good music can, with pride, be playful rather than serious, diverse rather than unified, engaging to both body and mind, in dialogue with manifold styles and genres, and collaborative to the core. We can widen the scope of what music we value and reconsider the conventional rituals surrounding it, while retaining the joys of making music, listening closely, and caring passionately. Introduction—Good: What Values Do We Bring to Music? 7. Connected: What’s at Stake in How We Love the Music We Love? "Here's a new take on what makes Handel great, with fine-toothed-comb analyses from Beethoven to The Beatles, and a passionate case for a collaborative, participatory approach to making music. It's a persuasive argument for reappraising how we integrate this beloved art into our lives." "Sheinbaum illumines the musical attributes that have traditionally been used to define masterpieces in the Western classical tradition and demonstrates that they do no such thing. Through detailed analyses of well-known compositions in both the classical and vernacular traditions, he shows that such qualities as seriousness, organic unity, and originality, while often positive traits, cannot and do not serve to isolate classical compositions from popular musics, nor are they sufficient to the identification of masterpieces within either tradition. This is an important and useful book and a must-read for anyone still tempted to declare the overarching superiority of a single composer or style." “Good Music dives into the artistic core of a vast array of works — everything from Miles Davis’ Kind of Blue to Bruce Springsteen’s The Rising and the Beatles’ Sgt. Pepper’s Lonely Hearts Club Band. All of these defy the generalizations associated with their categories. They’re not formulaic but highly original and innovative. Like their classical counterparts, Sheinbaum says, they’re thought pieces that reward deep thinking while providing satisfying entertainment. By the same token, classical genres often offer more than just cerebral stimulation—they can, Sheinbaum insists, 'be explored for how they engage the whole person.'"